We live in a time, or perhaps just a version of a single plane of existence, surrounded by war. No matter how high the skyscrapers we build, how much technological progress we make, it seems impossible for us to crawl out of our bloodied trenches. As it stands today, war has the look of the mythical dog Cerberus. One head is designated for religious fanaticism fueled land wars. Another is the oil drenched war on terror. And last but not least is the war on drugs. 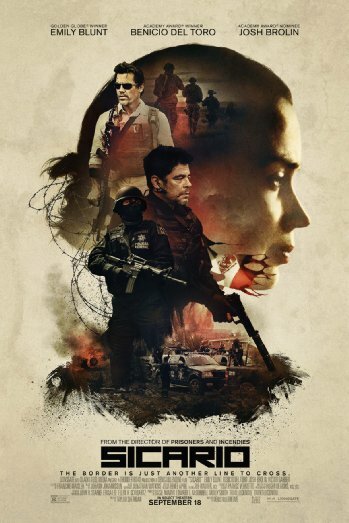 Sicario is a cartel drug drama with shades of all three uphill battles, and it unfolds in ways that are both humanely delicate and frighteningly barbaric. Ignorance and arrogance allow history to repeat itself, and as such, our world is one on the brink. Fear lives among us and spreads through our streets and paths and dirt roads, a carrier for the cancerous virus that is hate. 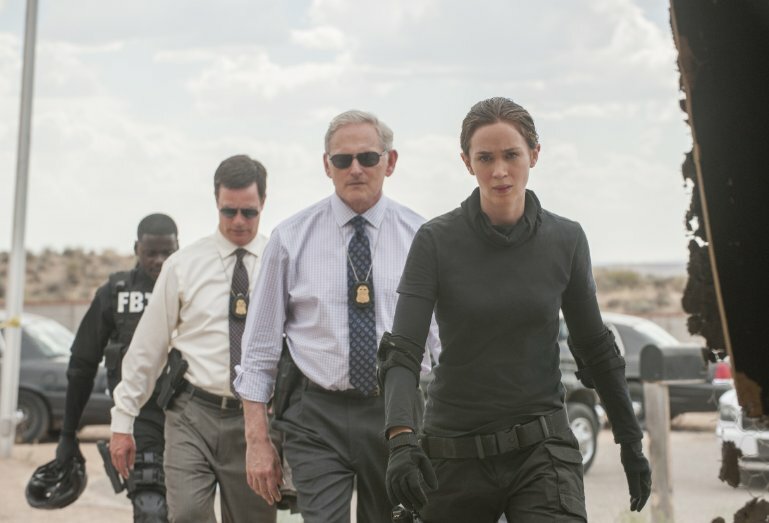 Sicario, ultimately, tells an all too common story about the flaying of humanity. What lies beneath is raw. Kate Macer (Emily Blunt), a FBI special agent with a love for the law, is summoned to join a task force team to track down a drug lord. A man with no face. A ghost in the flesh. Kate is a subdued character, largely in the dark on critical details, unsure if her presence is welcome or needed and whether or not she is being used. There is a secrecy to this story, and the epidermis becomes punctured and stripped away little by little until we find the meat and the bones. Typically sweeping up the messes of the cartels in Arizona, Kate heads off to Mexico with her new team to find the source of her plight. 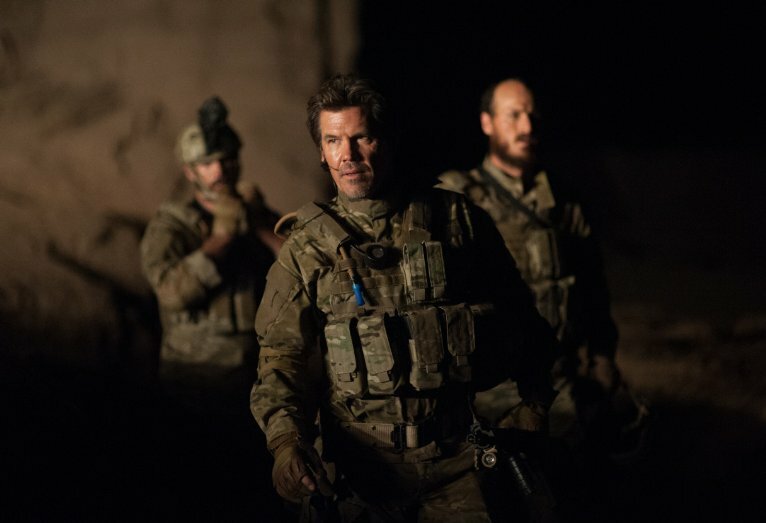 The team is led by Matt Graver (Josh Brolin), a desensitized man of war capable of a smile and a laugh in the face of pure evil. 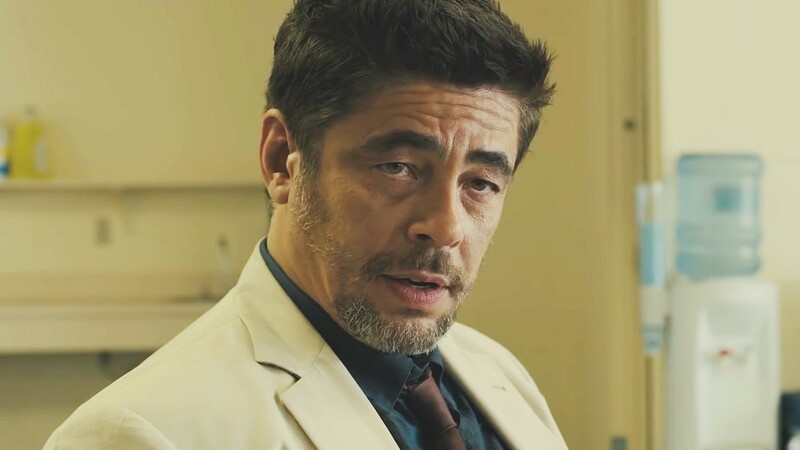 The most mysterious of the bunch is Alejandro (Benicio Del Toro). He is a lone wolf, working his own agenda within the group, trying to right his own wrongs from a shadowed past. Sicario challenges the audience to judge these characters. To read them by their hardback covers. Do so and know that you’ll encounter an unexpected and sometimes undetermined depth. Sicario is an action thriller willing to rest its weight on intimate drama rather than explosive warfare. That is crucial. Anymore, it seems impossible to find a movie that welcomes silence. We are tortured with sound to the point that nothing resonates. All crash and roar and scream and yell. Some dialogue goes undeciphered and unheard because, as it should, these people talk how people in these circumstances would: unclear, hurried, out of cadence. The naturalism of the sound mixing only works when the picture aligns accordingly. And from Roger Deakins, the sublime and intricate master of film photography, Sicario is nothing short of remarkable. Overhead shots tracing our characters’ pursuit through the ravaged streets of Juarez evoke an infinite quest. The simplicity of his light design will go unnoticed until his brilliant work with thermal and night vision lenses, but just know that this is art. This is cinema. One shot in particular, showing our blacked out team walking into battle against the backdrop of a starburst sky, is the work of a supreme innovator. Few painters could create such an image with such a complex palette. Deakins is an Oscar front-runner. Directed by Denis Villeneuve, Sicario may be his most languid work to date, as well as his most timely. Of any modern director I’ve seen, Villeneuve seems to have the most passionate distaste for pacing. This is a slow movie with spats of tension and relief, fits and calmness. But the man is a mathematical filmmaker, every teacher’s dream, in that he shows all of his work. We get it in reverse, and once the conclusion comes, in all of his films, every single piece adds up to the only possible outcome. A shockingly simple and animalistic decision. Those answers test the depravity of humankind and our willingness or contempt with doing right from wrong…if we even or ever can determine one from the other. With Deakins’ striking visuals, Jóhann Jóhannsson’s charred and pulsing score, Sicario is an awards season knockout with a point, a message, a constructed purpose. For how large the movie is in terms of casting, it’s actually rather light in developed characters, played by our marquee headliners. 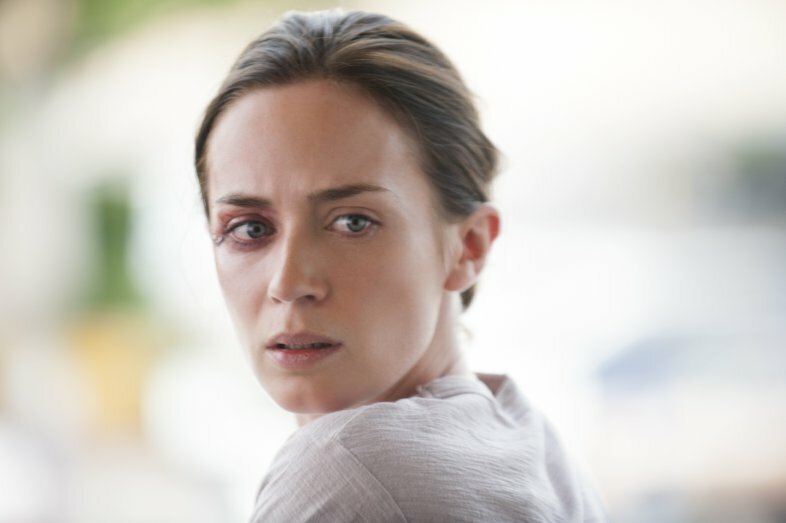 Emily Blunt admirably leads the story as a whistleblower in over her head, seeing things she should not see. Blunt somehow manages to bring a calmness to a heavy character, but since Kate is so subdued and unspoken, traits that don’t play well to voters, her restrained performance will likely go unrecognized. As will Brolin, who does some career best work here. Brolin has a natural Texan swagger to him, a charm recognized by him and by us, and it’s infectious. But Matt Graver may be a little too combative and a little too abrasive to garner the attention he deserves. I believe Brolin’s work here is the most detailed and layered, but the nomination and possible win will go to Del Toro for his supporting role as Alejandro. He’s the kind of guy you hope never sits down at your poker table. No read and no tell. A machine. Alejandro sits in the passenger seat in the narrative, sometimes literally, for most of the story. Then he comes full circle, takes the wheel, and the demanding command Del Toro shows in the span of 20 or so minutes is some of the best acting you’ll see all year. His talent is ruthless. Interspersed throughout Sicario in less than 5 telling scenes is the life of a small Mexican family. A wife who exists only in the kitchen. A husband and father who freelances as a corrupt police officer, taking his morning coffee with more booze than bean. And a young boy who just wants to play soccer; a lighthouse beacon of innocence searching for a place to focus his attention. By chance and by pure evil virtue, a mere 3 hours before I stepped into my theater another gunman with grisly motives and false pretensions took the lives of 9 innocent students in Oregon. People who, presumably, were trying to make something of themselves. To learn and to grow. Villeneuve’s film has political musings and religious fables and all the Americanized attempts to thwart terror that you would expect. But like those who commit these unspeakable crimes, whether on our soil or in the no hablo inglés partitions across the border, Sicario speaks to a broader, more encompassing message. Revenge sought and earned is not an endgame or an answer; monsters can only produce monsters. So in the last shot, when we see children playing soccer, pausing to acknowledge earshot gunfire and then resuming their game, you wish that things weren’t that unremarkably simple. The deadly routine of Sicario and its perpetually moving machine of death is as topical as it is disturbing, disquieting, and most of all devastating.